The secret to these flavourful grilled chicken breasts is the three ingredient marinade, made easily with Kraft Dressing, fresh oregano and a splash of lemon. Pour dressing over chicken in resealable plastic bag. Add oregano and 4 lemon slices; seal bag. Turn to evenly coat chicken with dressing, squeezing lemon slices in bag to release their juices. Refrigerate 30 min. to marinate. Remove chicken from marinade; discard bag and marinade. Grill chicken 5 to 7 min. on each side or until done (170°F), adding remaining lemon slices to barbecue for the last 2 min. 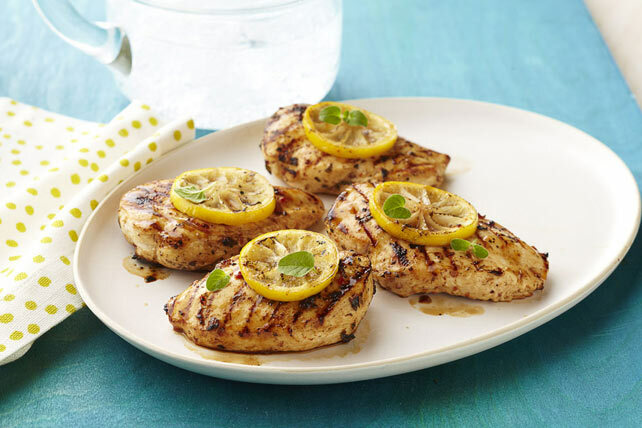 Serve chicken topped with grilled lemon slices. What if the barbecue runs out of gas unexpectedly or it starts to rain? That's easy. Just place the chicken on a baking sheet and bake in 400°F oven for 20 min. or until done (170°F). Marinating the chicken in the resealable plastic bag is a great tip. It evenly coats the chicken in the marinade and makes the chicken freezer-ready or easy to take along to the cottage or a potluck dinner. Help your friends and family eat right with this flavourful chicken that can be part of a healthy eating plan.